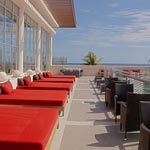 Timeshare at Mia Reef Isla Mujeres is more a refuge in paradise than a hotel. Its exceptional condition provided by nature takes to a privacy and exclusivity for our guests that difficulty is found in any other Timeshare property in the area. Enjoy all the advantages of being surrounded by the Caribbean Sea, fascinating tones and vegetation aromas without missing the opportunity of visiting the world famous coral reefs for snorkeling and admiring submarine flora and fauna of the island. The blue waters surround you in every direction. Sugar-white sands reflect the warm sun. Gentle trade winds rustle through palms. This is the Mia Reef Isla Mujeres, just over six miles from Cancun at the northern tip of Isla Mujeres; located at a private islet accessible only by a private pier. With 129-room situated on the natural beautiful and super-relaxed Isla Mujeres connected by a bridge spanning a shallow channel; adding an indulgent sense of privacy where you'll enjoy stunning views of coral reefs and crystal waters. Owning timeshare at Avalon Reef Club Isla Mujeres could never be easier to give you and your family, a holiday of a lifetime for a lifetime.